[New York]: Lawrence E. Spivak, Publisher, n.d. . First edition. Age darkening to text block, edge rubbing, name to upper right corner of front cover, 12 mm split at lower left front cover/spine panel, a very good copy. (20883). Small octavo, pp. [1-2] 3-126 [127-128], pictorial wrappers. Bestseller Mystery No. B40. Digest size magazine format, paperback original. This volume consists of The Big Knockover and $106,000 Blood Money collected together as a novel. First book publication. Both stories first appeared in Black Mask. Layman A9.1. Bestseller Mystery. New York: Lawrence E. Spivak. Digest Size. , 1943 . 40 very good -fine, spine roll, reading crease PBO. [New York]: Lawrence E. Spivak, Publisher, n.d. ., 1943. First edition. First edition. Spine panel lightly rubbed, top corner crease beginning on page 53 and becomes larger through page 126, but not affecting any text, else a good copy in pictorial wrappers. A Continental Op novellette originally published in 1927 in "Black Mask" magazine. LAYMAN p.54. A9.1. New York: Spivak First Lawrence Spivak edition in the Bestseller Mystery series No. B40. Slight blemish on front cover.. First Thus. Mass Market Paperback. Very Good. New York: Lawrence E. Spivak. Fair. 1943. First Edition. Soft Cover. One of the Bestseller Mystery series (#B40) published during World Warr II using wartime paper restrictions. 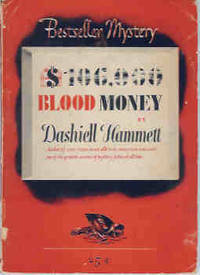 This is a complete and unabridged reprint of Dashiell Hammet's 1927 book, with a cover price of 25 cents. This edition appears to be its first appearance in book form. Spine is somewhat curved, text was bound in upside down. Covers show some edgewear and scuffing. Text is browned, with watermarks on corners. When a million dollars is stolen from two banks in an afternoon, the Continental Detective Agency must solve the crime. ; 12mo - over 6¾" - 7¾" tall .